Ethnic food in Rome is always risky. We Italians are really passionate about our food culture (it takes about 10 seconds of talking to us to realize that) and we don’t always look favorably towards foreign food. Fortunately places like Smor exist and completely prove us wrong. The whole concept behind this street food restaurant is bringing modern Scandinavian street food here in Italy. 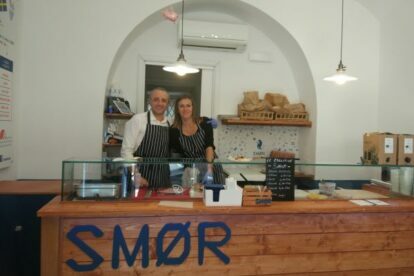 You can find excellent Smorrenbrod, a traditional open faced sandwich with a topping of your choice, and the Tunnbrodsrulle, kind of like a Swedish kebab, which is truly as good as it is hard to pronounce. The star of both these dishes is the fish, normally boiled or smoked, all of them delicious: the pulled salmon BBQ is just out of this world. In addition, you can find some great salted codfish and some excellent sandwiches with boiled meat from a quality shop in Trieste. You can be sure you will leave this place full. The thing I love the most though is the passion of the owners, truly convinced of what they are doing and ready to explain anything to you: it really makes a difference. You might not have the greatest opinion of Scandinavian food right now, but just one visit here will completely change your mind.